There has been a concerted campaign in the mainstream press over the last few years to smear the NHS. This is all part of the government’s misinformation campaign to discredit the NHS so it can turn over as much of it as possible to private healthcare companies. But there’s another shocking recent survey you probably won’t have heard much about either. 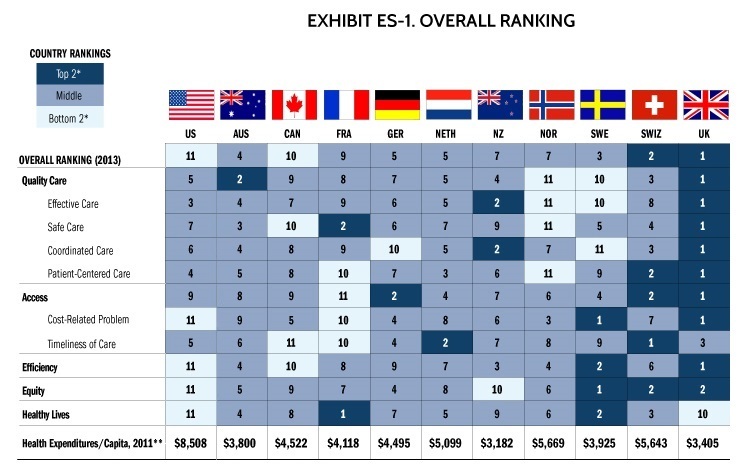 If the government has its way and keeps on starving the NHS of resources, expect to see the UK dropping VERY rapidly down the international rankings over the next few years. But shhh! Whatever you do. Keep it to yourself. Thanks. Yes, the Tories and their sick Lib chums are running yhe NHS downhill into the grasping hands of private healthcos. Sometimes I still feel proud to be British. Thanks to Nicola for sharing this, and for seemingly constantly campaigning for our NHS, one of our nation’s most valuable assets. A good one to bookmark for the next time you hear someone try to argue the NHS isn’t one of the best health systems in the world. yerbut, the bottom line shows a paradox, people in countries like France and Sweden which have health services which a lacking in some areas think they have healthy lives, while Brit who think our health service is wonderful are last but one. Maybe this just shows that Britian is a nation of hypochondriacs. Will send it on to a cousin in the USA who has been campaigning for “Obamacare” against the Tea Party there, because she knows the value of socialised (not socialist as the Tea Party have it) medicine, and this will really help. Great stuff. As always. According to the msm the nhs is failing…. Fascinating. Who Ororganized and funded the International survey. Need to know this when arguing thesewell issues with right wing interlocutors. Many thanks. Is this a real survey or just made up? Seriously, as an expat living in Australia, you do t realise how good the nhs is. It’s free, I pay a fortune for health care. You why the USA is so good? Because again the rich pay for health care, the poor don’t go. Get a grip you ungrateful idiot. Neil – a link to the source of the survey is in the article. Tory obsession on cutting costs always ending up costing MORE: when the consequences of staff shortages mean there’s no capacity to deal with the unexpected (eg border control fiasco, flood chaos). Then we suddenly hear about how they are spending more than ever on crisis management. First of all, Jeremy Hunt has been tweeting the international figures all day, so they’re not trying to cover this up. Secondly, it is ridiculous to conflate the differing health services in the UK as a ‘national’ health service anymore. You refer to a staff survey from NHS England, as if it represents the UK. The international report talks of a UK NHS, but the reality is that the far-reaching structural reforms inflicted on NHS England have pulled it in a totally different direction from the rest of the country. The different health systems in the UK don’t just have a different GP contractual situation, or a different leadership structure, or different pay grades for nurses, or a different role for pharmacists, they have a totally different ethos from each other. @tomwfreeman: the survey was already actually a couple of days old by the time I wrote about it yesterday morning. At that time it had been totally (and strangely) ignored by the UK media. This blog post then went a bit viral and in the evening the Guardian and the Indy had picked up on it and those articles started to be shared widely too..
Then today Hunt mentioned it. Someone more cynical than me might say Hunt’s hand was somewhat forced….. They didn’t ask people whether they felt healthy to get this data. It’s based on 3 indicators: mortality amenable to medical care, infant mortality, and healthy life expectancy at age 60. Which still leaves a bit of a paradox, but these 3 factors are influenced by much more than how good the health care system is. Why are we paying for care homes for those too ill to live alone? Why are we paying for prescriptions? Why do we pay for a multitude of other things on our free NHS such as dentists? I can see why they don’t wish us to view it. I presume anything positive concerning our amazing NHS is ignored or criticised. I believe the NHS to be a health care system to be admired and loved. A system copied and envied in many countries. Although this government, see pound signs and profit. Similarly like our welfare system, policing and even our once admired (still is, i think). postal service. I believe money, greed and power to be an evil combination. can anyone believe a survey stating that the US and France rank about the same when comparing cost-related problems? This survey is about what people ‘say’ and ‘report’, and it doesn’t even detail how these variables are assessed. Such a lack of information. I think it only shows what countries are satisfied with what they have -regardless of what they have (Hi UK!) and what countries tend to complain -regardless of what they have (Hi France!).. i.e. our NHS is not free for all! If we’re #1 then perhaps the governemnt is right. But it’s not more resources that are required, but a fundamental review of the entire NHS “system” and a better utilisation of the excellent resources (including staff – the main and best resource of the NHS). For example, why overburden GPs with visits for inhalers (Australia doesn’t). Or patients going to see them with muscoskeletal disorders? Such patients should be able to visit NHS registered physics / osteopaths straight away. Etc. Etc.